Hey, we're losing warm fuzzy things now because of global warming. Polar bear cubs in Alaska's Beaufort Sea are much less likely to survive compared to about 20 years ago, probably due to melting sea ice caused by global warming, a study released on Wednesday said. The study, published by the U.S. Geological Survey, estimated that only 43 percent of polar bear cubs in the southern Beaufort Sea survived their first year during the past five years, compared to a 65 percent survival rate in the late 1980s and early 1990s. "The changes in survival of cubs are very dramatic," said the study's author Steven Amstrup, polar bear project leader for the USGS Alaska Science Center. The falling survival rate comes as a warming climate has melted much of the sea ice off Alaska's northern coast, limiting polar bears from hunting for food at the ice's edge, Amstrup said. "The things we're observing are consistent with a population that is undergoing nutritional stress," said Amstrup. "We can't say definitively it's because of changes in the sea ice, but we don't know what else it would be." 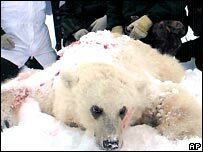 The study also found that adult male polar bears captured after 1990 were smaller than those captured before then. And nutritional stress sorta ties in with this. When is free trade not free trade?